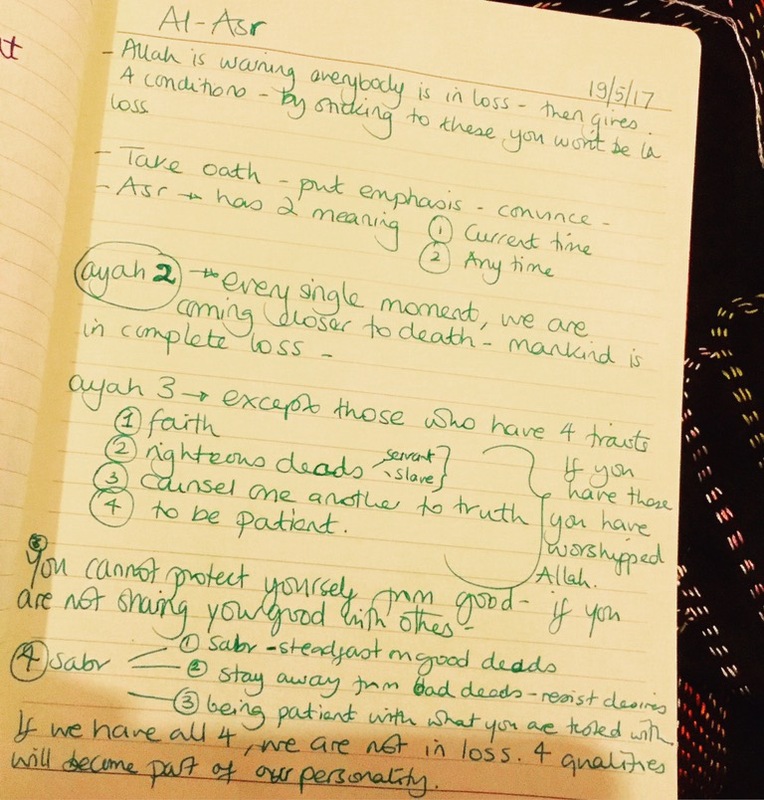 Just before I attended this evening’s Tafsir class I was listening to a facebook live talk by Fadil Soliman – he said achieving taqwa in Ramadan is about being mindful of any sins we may commit, prepare ourselves now by thinking where we may go wrong, where our flaws lie, be mindful of the situations that cause us to sin – this mindfulness of Allah is achieving taqwa. I left for my class with this in mind, thinking wow, this stuff is deep, I need to learn how to achieve this mindfulness, and find a practical way to do this. Then in class, the teacher covered surah Al Asr, he said he’s preparing us for Ramadan, because the message in this surah is sufficient to guide man to Allah. Allah tells us in this surah, that we are in loss, every moment we have is taking us closer to death, making every moment we live precious, therefore it’s very important how we decide to spend it. Allah then tells us the way we can ensure we are not in loss, He lists four things that will bring us success in the Hereafter; our faith in Him, our righteous deeds, when we counsel others to the truth and when we are patient. Our teacher said, when a person has all these, they have worshipped Allah, making them fulfil their purpose in life. We spoke about each one of these four qualities, and how they can encompass every part of our lives. The teacher broke down having patience even further, saying sabr is made up of three parts: being steadfast with good deeds, resisting desires and staying away from bad deeds and being patient with all that you’re tested with. These four qualities, if followed, then can become part of our personality, a personality that Allah wants his slaves to have. This discussion of surah al Asr gave me the answer to the questions I had when I left my home this evening, the questions about how I will practice being mindful of avoiding sins, I realised sitting in the class, that by allowing my mind to concentrate on these qualities Allah has listed for us, we can stay away from sin, if we keep ourselves busy with these traits, we are being mindful of what Allah wants. This year I’ve been really struggling with preparing myself for Ramadan, mainly because I want to achieve so much and I started to feel overburdened with my thoughts, but Allah in His Kindness has allowed me to find a way to understand what it is I want. Ramadan is about achieving taqwa – an awareness of Allah, a constant realisation that we are His slave. Let’s head towards that inshaAllah.